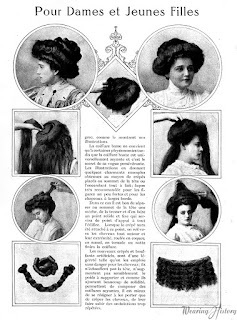 Once again, with the help of Lauren of Wearing History, I bring you a something a bit more modern: a discussion of hairstyles from Le Miroir des Modes, 1908. The Greek style has invaded the domain of evening and at-home city toilettes; but it still makes its influence felt on the coiffure, so well that those of the evening overall have become low, with full, waved bandeaux, the Greek knot or chignon rolled softly on the nape. This new type of coiffure necessarily calls for new ornament, thus we see the bandalettes, the ribbon ties, the gold and silver braids, the crowns or foliage complete the classical aspect of our elegant women. To be more fitting in profile and in the whole shape the chignon is placed higher or lower; but the front and sides of the coiffure remain vague, and forming a light halo around the face. For any type of coiffure the hair is generally divided in three parts: the back is attached with a cord or held with shell pins, the two front parts, forming bandeaux or a bouffant, will be pulled up on a crêpé [a braided switch ending with curls, pictured in the second page] or simply held by combs. In certain cases when the front is arranged, the back part is left down, mixed with other parts and the whole used in the formation of the Greek knot, as our illustrations show. The low coiffure should only be worn with certain face shapes while the high coiffure is universally flattering and that is the secret of its persevering vogue. The illustrations give some charming examples obtained by means of crêpés placed at the top of the head or encircling it entirely. ; a fashion very recommended for the slightly strong figures and for hats with large brims. In this case it is good to separate a section of hair from the top of the head, to braid it, and to make it a solid and fixed point which will serve as the backbone for the whole edifice. When the crêpé is attached at this point, one raises the hair all around it and their ends, rolled in coques, in a knot, in a twist or braided, will finish the coiffure. 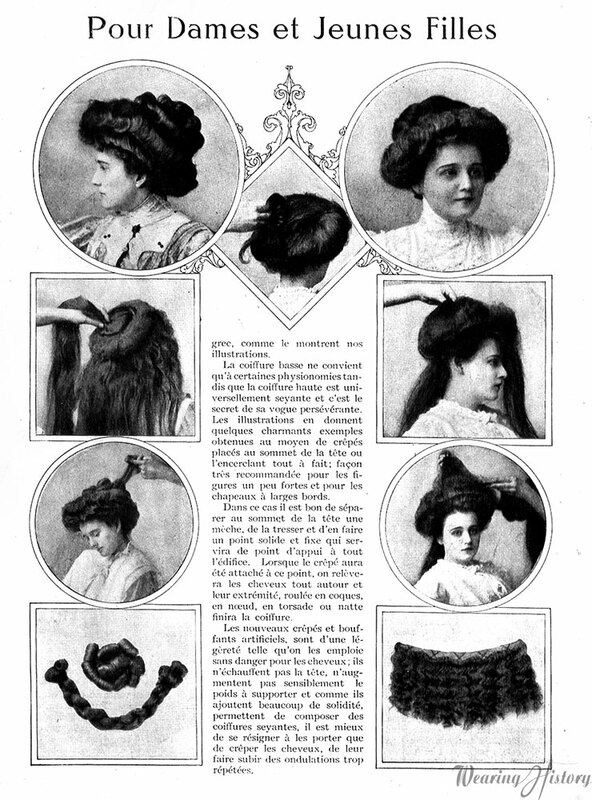 The new crêpés and artificial bouffants are of a lightness such that they are used without danger to the hair; they do not heat the head, do not noticeably increase the weight, and as they add much solidity, permit the composition of flattering coiffures, it is best to resign oneself to wearing crêpés, to make them be waved repetitively. 'Evening! Ooh, another good Edwardian hair article. Do you mind if I add this to the resources list on my blog's 1909 coiffure article? I still lots of views weekly of that post. 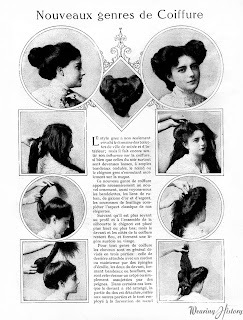 See "Hairstyle Tutorial: A 1909 Edwardian Coiffure" at http://zipzipinkspot.blogspot.com/2009/08/hairstyle-tutorial-1909-coiffure.html. Absolutely! Just make sure to link to the original Wearing History page as well, the pictures there are full size.